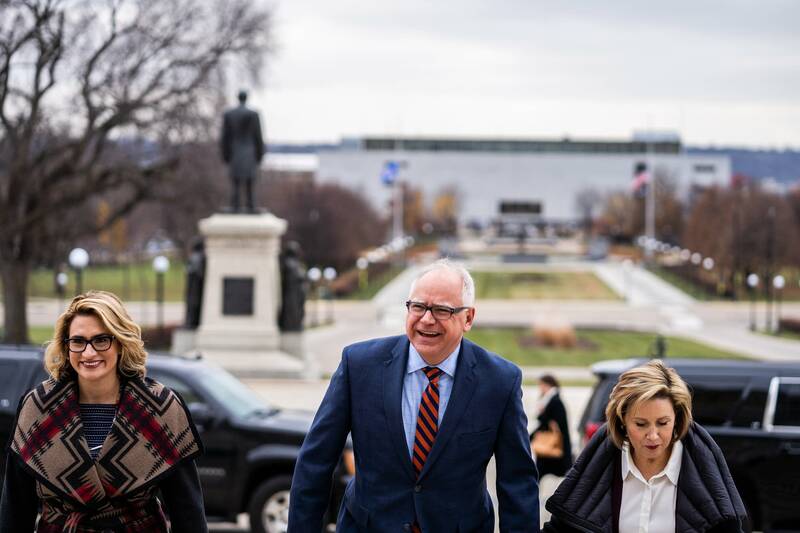 Hand-in-hand with wife, Gwen, Tim Walz made his way to the Minnesota Capitol's front entrance Thursday. 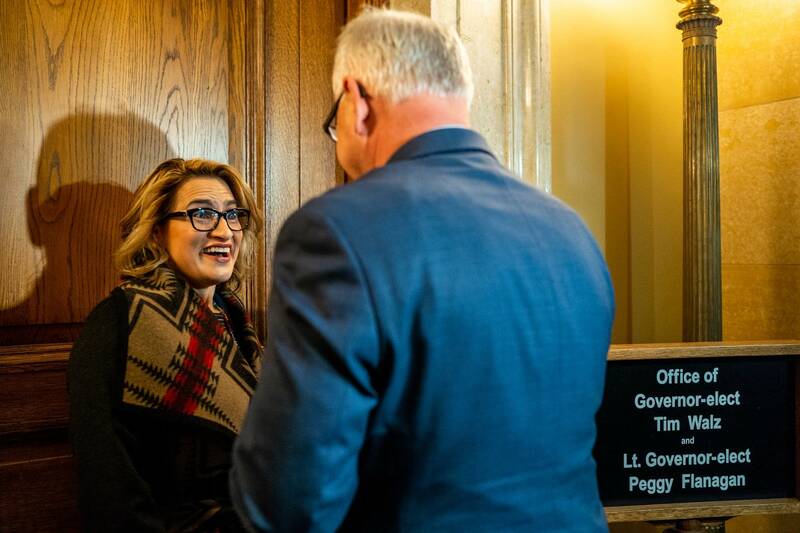 After stopping in the Rotunda to look up at the soaring murals, the incoming governor and first lady hopped into an elevator with Peggy Flanagan, the next lieutenant governor. They stepped out on the third floor and got ready to enter their temporary office quarters for the first time. "We talked about opening doors," on the campaign trail, Walz said to Flanagan. "That's right," she replied, opening a large wooden door. "Here we go," he said, following close behind. It was their maiden visit to the Capitol following the Democrats' runaway win in the open governor's race on Tuesday, defeating Republican Jeff Johnson by 11 percentage points. The whole event was something of a dry run for the real takeover, which won't happen until Inauguration Day on Jan. 7. But Walz and Flanagan have a lot to do before then. 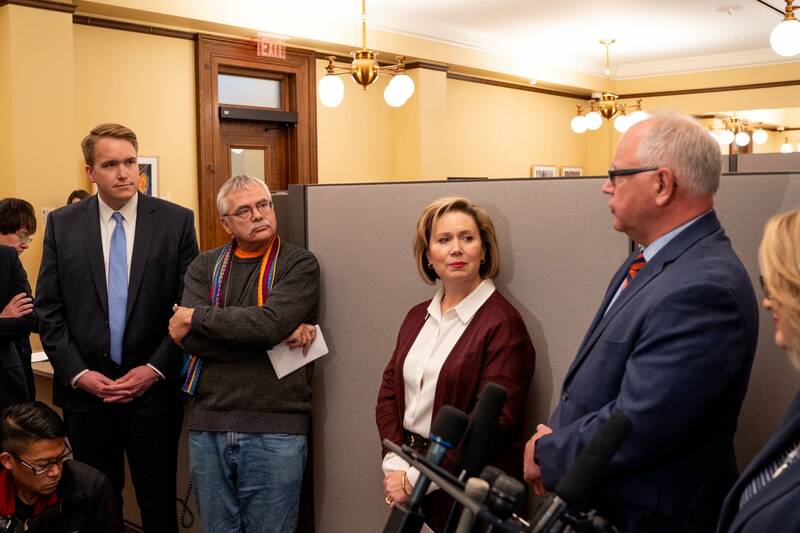 They need to fill about two dozen cabinet posts, select other key staff and set about turning campaign promises into actual policy for a newly divided Minnesota Legislature to consider. Oh, and they'll have to get going on a new two-year, nearly $50 billion budget proposal that's due a few weeks into February. They'll at least inherit a far better budget situation outgoing DFL Gov. Mark Dayton did eight years ago, when the state was facing a projected $6 billion budget deficit. Walz is benefiting from a strong economy that continues to produce tax surpluses and has helped refuel budget reserves. "What a difference eight years makes," said Minnesota Management and Budget Commissioner Myron Frans, who was part of the Dayton team throughout his two terms. "Things are looking good. Revenues continue to come in ahead of forecast. The unemployment rate is now down to 2.8 percent. We've added 313,000 jobs in the last eight years," Frans said. "So it's an entirely different perspective for Governor-elect Walz and Lieutenant Governor-elect Flanagan to take over." That's not to say everything is rosy. The tax that supports the MinnesotaCare health care program will expire at the end of 2019 unless Walz and the Legislature extend it. And transportation funding remains a question mark, with Walz saying he'll push for a gas tax increase. "The need is apparent, the lack of the funding to make it done," Walz said. "The responsibility, as I ran on, you can't just say you're not going to do anything in terms of revenue and budgets and you're magically going to get roads, bridges and transit. So yes, you could expect to see that." He didn't put an amount on the possible increase to the per-gallon tax, but at any number, he faces a challenge passing it through a divided Legislature, including a Senate controlled by Republicans. Republican Senate Majority Leader Paul Gazelka pushed back on the idea of raising the gas tax at all, suggesting lawmakers could use any state surplus to fund roads and bridges instead. "If you look at the last two years, we had massive increases in spending toward roads and bridges," he said. "We can do that without a gas tax." 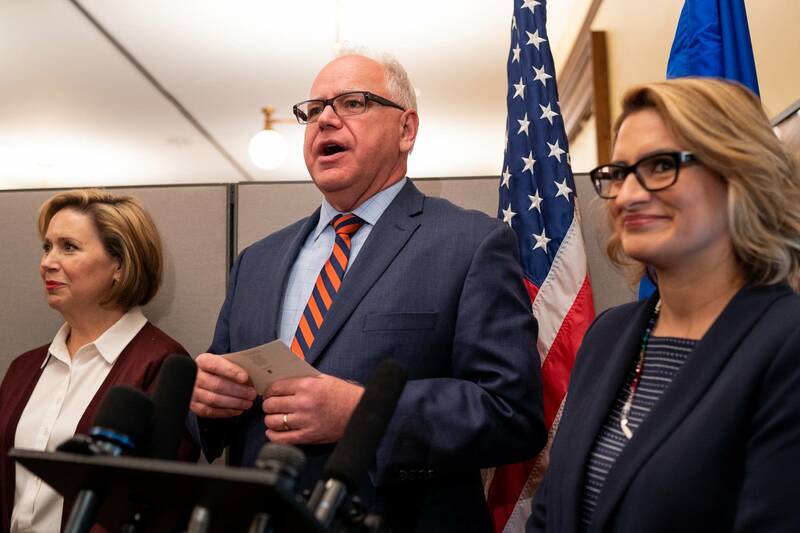 Walz and the Legislature also have plenty of work to do on Minnesota's tax code, which is substantially mismatched with recent federal changes. Better known in the Capitol as tax conformity, a deal to align the two fell apart late last session. Frans, a former state Revenue commissioner, says it's doubtful that changes can be made fast enough to accommodate filing of 2018 income tax forms so lawmakers could be forced to look ahead to 2019 tax season. "It would really be disruptive to make any of those changes after January," he said. The transition is just starting, but Walz has already launched a website. Flanagan will chair an advisory board to the transition that will include faith leaders, CEOs, entrepreneurs and others. They will help vet possible commissioners, as well as set early budgeting priorities. Walz said he doesn't plan on releasing a "surprise" budget in February, hinting that pieces of his plan could start rolling out before that. On Thursday, Walz named Minneapolis attorney Chris Schmitter as his chief of staff, tapping an aide who previously worked in the Walz congressional office. Since the election, Walz has spoken by phone with Dayton. He has also conferred with Republican Senate Majority Leader Paul Gazelka, Democratic Minority Leader Tom Bakk and likely Democratic House Speaker Melissa Hortman. Walz says he's committed to working together with all of them. "If you missed the message of this election: It's people want government to function. They want it to deal with things that affect their daily lives," Walz said. "And they're pretty much done with the drama."